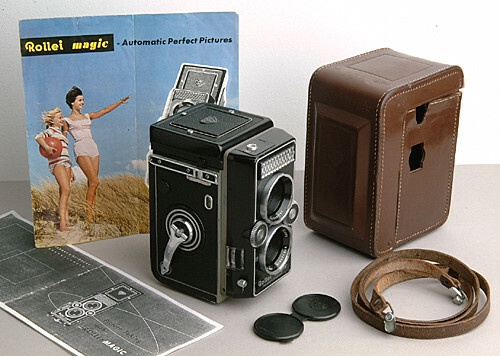 The Rollei magic is a medium format TLR camera manufactured by Franke & Heidecke, Braunschweig, Germany. It was Rolleis answer to the desire at that point in time for a TLR with an automated exposure control. Rollei could achieve this when the shutter company Prontor designed a new shutter for just that purpose, the Prontormat-S. 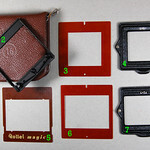 The Rollei magic uses 120 type Rollfilm. 12 6x6cm square images can be captured for each roll of 120 film. By using a special mask set the camera can be adapted to shoot 16 images 4x4 or 4x5.5cm on a roll. The mask put into the filmgate does automaticly change the frame counter from 12 to 16 exposures. A big difference with the Rolleiflex is the fact that the Rollei magic uses front-cell focusing instead of moving the whole lens board. 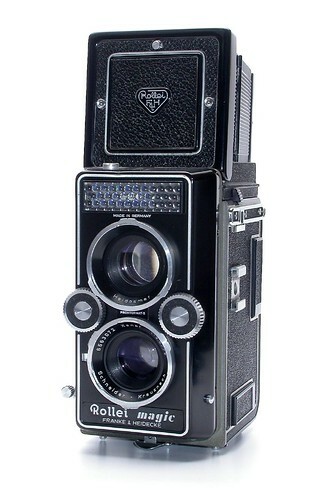 Because many after-sales complaints were received about the lack of a proper manual speed control Rollei came up with a second model, the Rollei magic II to rectify this. Taking lens: Schneider-Kreuznach Xenar 1:3.5 f=75mm. Viewing lens: Heidosmat 1:3.5 f=75mm (also a Xenar). 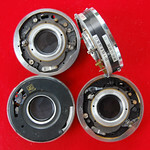 Shutter: Prontor Prontormat-S model 565 k1. Automatic exposure: speeds 1/30 to 1/300 sec. at diaphragms 3.5 to 22. Manual shutter settings : Flash 1/30 sec. and B, both allowing diaphragms 3.5 to 22. Film speed settings : 12 to 1600 ASA. Shutter: Prontor Prontormat-S model 602 k.
Automatic exposure: speeds 1/30 to 1/500 sec. at diaphragms 3.5 to 22. Manual shutter settings : 1/30 sec. to 1/500 and B, both allowing diaphragms 3.5 to 22. This page was last edited on 27 November 2016, at 07:03.